Little Eric was looking out of the window, with a rather mournful expression on his face. "What's up pal?, asked Tetley, looking up from his Dalesman magazine. "Just that it's a while since we went for a walk", he replied. "I know pal", said Allen. "But Dad has been having a really busy time, with taking Uncle Brian to his heart rehab class, having the garage roof replaced and other commitments." "You're right", agreed Little Eric with a sigh. Tetley had the iPad in paw, "there's a day down with Uncle Eric for Thursday, and the weather looks good. So, let's keep our paws crossed." Just then Shaun and Grizzly arrived with the flasks and cakes, bringing a smile to our faces. "Great", cheered Southey, heading off with Allen to get the mugs and plates. "What cakes are there? ", asked Tetley. Grizzly replied, "I have made chocolate caramel shortbread, and Little Eric has done fruit scones with butter and raspberry jam." So helping ourselves, there were soon murmurs of satisfaction, Allen voicing, "the scones are delicious, pal." "Thanks", replied Little Eric, who was feeling more happy now. "And so is the shortbread", went on Shaun. On Wednesday evening we all waited in anticipation, for Dad's conversation with Uncle Eric. After he came to tell us, "a walk is on Lads. We are going to do one that Uncle Eric has from the Westmorland Gazette in Lower Dentdale." "That's nice area to walk", replied Tetley. "I don't mind where we go", said Little Eric. "It will just be great to be out in the countryside." We got up early, all lending a paw to get the picnic ready and safely stowed in Allen's rucksack. Looking out we could see that the day was to be dry with sunny periods and warm, so unsurprisingly Dad was in shorts. "How do we get to the start? ", asked Southey as Dad backed out of the drive. "Up the Lune Valley to Kirkby Lonsdale, and on to Sedbergh", replied Shaun. "There we will go round past the school, to a t-junction, turning right towards Dent. It is then just a short distance to Millthrop Bridge where there is a layby on the Dent side." We called a cheery. "good morning", to Uncle Eric. "Good to see you lads." he replied. Dad was soon ready, so we quickly got settled in his rucksack. Then this shouldered, off he strode walking the road towards Dent. In just a few yards Dad was surprised when Uncle Eric took the lane left to Millthrop. "Didn't you see the sign", said Uncle Eric, laughing. He would had it not been obscured by the foliage. This brought us to a junction. "We go left", said Uncle Eric. Strolling along the quiet lane Tetley commented, "how nice to see the the wild flowers and buttercups in the fields that have been left fallow." Soon another junction was reached at Frostrow Lane, Shaun saying, "it's right here." Being in the rucksack we had the views behind, to the Howgill Fells. "Ahh", mused Grizzly, "we had some magical days completing that challenge." "Yes we did", replied Tetley. "Many of them without seeing another walker. It was then and still is the place to go for solitude." "What can we see? ", asked Southey, who had not been adopted then. "To the left is Winder, that dominates above Sedbergh", said Allen. Then pointing right,Tetley said, "those are Sickers Fell and Knott." "I wonder what that flower is? ", called out Little Eric, shortly. "An orchid, perhaps", mused Grizzly. "We could do with our pal Moss", stated Shaun. "He knows all about wildflowers." Here he is sitting in front of Fletcher, with Tebay to his left. He had taken them on a nature walk in the grounds of Armathwaite Hall. This was in April 2010 on one of Dad and Uncle Brian's many holidays there. Eventually passing Side Farm, the tarmac gave out, the path now stony, leading to a gate and ladderstile onto open fell, the sign reading Long Moor 1.5miles. This being our next objective. ...across Long Moor to it's flat summit. "We have been here before", called out Grizzly. "That was the day we climbed Aye Gill Pike", went on Tetley, pointing to the huge fell before us. "Oh, I remember that so well", sighed Dad. "All was green in the valley, but Aye Gill Pike was blanketed in snow." 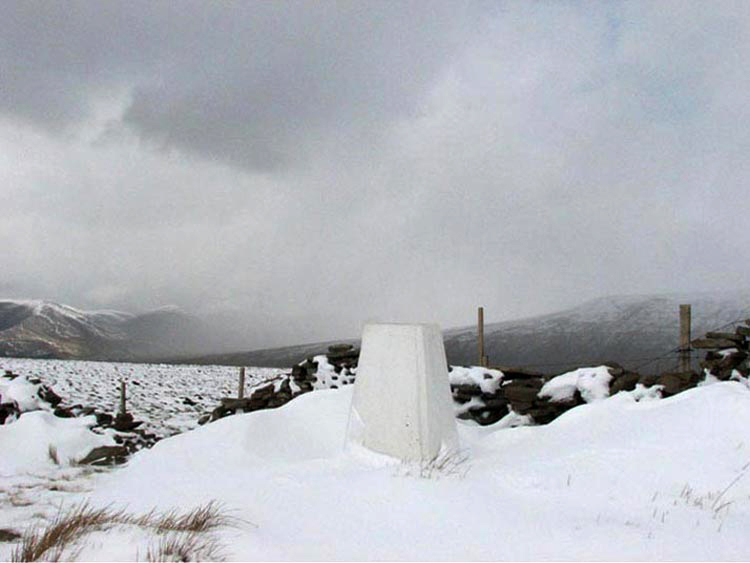 This of the summit, gives some idea of the conditions we faced. "It was some day and quite a challenge", said Allen. "We were all glad to finally get down into the valley again." "Well I have not been here before, so will you take our picture? ", asked Southey. Now with the slopes of Aye Gill Pike rising in front, the path descended to the gated stile on the right. This was crossed, to then follow the descending path by the wall. After a gated enclosure the walled grassy track brought us to gates near a barn and on through the farm where we encountered these sheep and lambs. "Sorry Allen, but I just have to take a picture", said Dad, lining up the camera. "I'll let you off" he replied grudgingly. Dad and Uncle Eric, had a chat with the farmer, before walking down the narrow road signed Barth Bridge. Met the farmer's daughter racing uphill on a quad bike. Also a car that we had not noticed at a sharp corner, prompting Little Eric to remark, "not the best place to us to meet." This was followed soon by the postman in his van. "For such a off the beaten track road, it's surely busy", said Uncle Eric. Eventually the main road was reached, where across the other side this field was full of buttercups. "We go left to Barth Bridge", advised Shaun. There was an option here for a longer or shorter walk. The longer one was at the bridge, ahead on the left side of the river to Dent and then back through the fields. However the decision was rather taken out of our paws, as the road for the longer route was blocked off and signed closed. ...and taking the Dales Way right via a stile. Dent Network of Gates was a project involving a local artist and schools to design plaques and the like celebrating things important to the local environment. From the date we guess this was done for the millennium. The delightful stiled and bridged way led by the river across the fields through the beautiful countryside so fresh and green. On each of the stiles etc., was one of the plaques. Here is a selection of those we saw. From the top (we think). Oak leaf & acorn. Heron. ???. Bird. Along here we passed a couple going in the opposite direction, the lady commenting to Dad, "I like your friends in your rucksack!" Eventually the route entered a field that tapered to a point. Both us and another couple missed that about 100 yards from the end, the route was left across the field to a stile and onto the road. Now right we walked the road passing Ellers. Dad replied, "yes it's time for lunch so keep you eyes peeled for a somewhere to sit. After a little while, Shaun said, "how about this banking." "Perfect spot", agreed Uncle Eric. We jumped out of the rucksack and got settled then Allen slipped his rucksack off and passed round the sandwiches, followed by delicious cake that Grizzly and Little Eric had made. All washed down with steaming mugs of tea. "That's better", sighed Allen, rubbing his tummy. "Mmm", agreed Tetley. "The cakes were delicious pals." So all refreshed we settled in Dad's rucksack, and continued on the road to Brackensgill. "We go right", called out Shaun, pointing to the track signed 'Gate (Deep ford)'. ...and walk on to the road. Crossed and followed the rising track right beside Gate Cottage, by the impressive doorway into the grounds. At the junction, Shaun called out, "we take the left track." This led us in front of the house called Gap, with impressive views across the dale to Middleton Fell. Beyond a gate the route led into fields, then on through woodland and along a walled grassy track. Through a further gate we followed the path with Sedbergh in the distance. This became stony and led down to the road. In the pretty hamlet is Spedding Cottage. "What a beautiful garden", enthused Grizzly. "And look" called out Allen, "it has justifiably won an award." Shortly at the junction we turned left along the road to the start. "That was a lovely walk, Uncle Eric", said Southey. "Thank you so much for suggesting it, we have thoroughly enjoyed it all", went on Allen. "Glad you liked it lads", he replied. So with goodbyes said, Dad then drove this happy group home.